Whether for a long brunch or a quick caffeine fix, cafes are an integral part of our cultural identity in Sydney. Going to a café is something we used to do before we had kids, which is still manageable, even enjoyable, with the little ones in tow. With families overrunning the cafe scene, we’ve seen the rise and rise of the babycino. Kids look forward to their babycino with almost as much gusto as their tired grown-ups look forward to their first coffee of the day. While once simply serving a babycino was enough to lure families, the competition is hotting up and a few places are doing something really special. 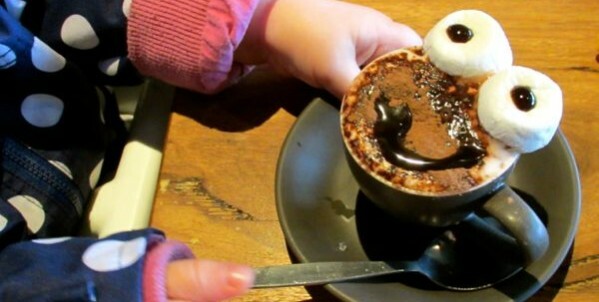 Here are our top babycinos in Sydney, so get sipping! This family-friendly cafe are known for their desserts made in-house (the gluten free brownie is heavenly), and their babycino art. We love that you get a complementary shortbread biccie with your coffee...sit back while your little one enjoys their almost too pretty to drink babycino - they can even make a their own babycino design request with the barista here! This place is packed on the weekends, so we recommend going here for a coffee date during the week. The babycino at Sorelle on Grande has been called the best babycino in Sydney on more than one occasion and it’s clear why...their Babycino Grande for $4.50 comes with a mini ice cream cone suspended over the cup of fluffy goodness. Run by two bubbly sisters this is a family-friendly café serving breakfast and lunch, as well as delicious homemade baked treats. The kid’s menu features nuggets, pasta and burgers, also all lovingly hand-made in store. If for some unknown reason your little one just wants the babycino (without the mini ice-cream cone) they are free with any coffee. Check it out before a swim at the beach, or make the trip just to try that Babycino Grande! The Vogue Café shot to fame for its milkshakes that are both figuratively and literally over-the-top. The milkshakes are piled high with mouth-watering treats like fairy bread and Oreos, or doughnuts and a Kinder Surprise. It might be hard to get your little one to settle for a babycino - the milkshakes are that good - but if you do, their V.I.B (Very Important Baby!) babycino is almost as magical as the milkshakes. For $2.00, your little one will be treated to a mini glass rimmed with melted chocolate and sprinkles, filled with milky froth and topped with coloured popcorn, accompanied by a marshmallow dipped in chocolate and sprinkles. From Monday through to Wednesday, kids under 5 eat for free here, too. The $2.00 babycino at Contessa Balmain takes the prize for cutest. With its little marshmallow eyes staring up at you and great big chocolatey grin it’s almost too cute to drink, but after their initial delight your kids are likely to slurp up the lot and end up with a big chocolatey grin of their own. There is a small kids menu and they serve breakfast all day. At lunchtime the linguine with meatballs is a perennial favourite, and the recipe is sourced from the Italian chef’s nonna. Promising “scones and tea like nanna used to make”, The Tea Cosy couldn’t be more adorable if it tried. Sitting in the back of the Irish Design shop in a historic building in The Rocks, the small menu includes a Devonshire Tea for you, and the Kids Devonshire Tea for your little one; for $8.00, this includes a single scone with strawberry jam and cream, and their oh-so-cute babycino with mandatory marshmallows. The scones are handmade on site each morning, and the chocolate dusted babycino is served in proper china that would do nanna proud, with hundreds and thousands being the cherry on top. The Tea Cosy is also the go-to place for novelty tea cosies, just in case you happened to be looking for one. Cafes that specialise in chocolate tend to do pretty well on the babycino front because of the yummy chocolate they use. For $2.00, both Max Brenner and San Churro do a chocolate-drizzled babycino that's a cross between a babycino and a hot choccie. For $2.50, Koko Black (pictured) in the Strand Arcade serves their babycino with a handmade milk choc teddy pop, and you can get some quality dark chocolate for yourself while you're here! Come to this easy-to-miss coffee spot for quality coffee and a FREE babycino, which was given two thumbs up by the popular food blogger Simon Food Favourites. Complete with a chocolate dusting and a marshmallow, the babycino comes in a little paper cup that's safe for little hands. The space is small though with just a few stools, so it's more suited to a pit stop than a mothers group date! Apart from being FREE, Flour Drum's super frothy babycino is generously served with two marshmallows, and has been rated as one of the best by babycino aficionado Simon Food Favourites. There's no glass dropping to worry about thanks to the kid-friendly plastic cup and spoon, and the staff are nice and welcoming. Surprise the kids on a weekend morning by whipping up babycinos at home. If you don't have an espresso/Nespresso machine, simply heat the milk on the stove or in the microwave, until it is hot but not boiling. If you have a French press, just put the milk in and pump up and down to aerate. This gives the best results, but you can also use a whisk if that’s all you have handy. You can even buy little hand-held milk frothers for around $15.00. Pour your warm frothy milk into a small cup and then get creative with toppings - the kids might like to help, too. Try the classic dusting of chocolate, and 100s and 1000s or any sprinkles for a pop of colour. Mini marshmallows, toasted coconut, or grated chocolate are some other ideas. Pop a couple of marshmallows or a little biccie on the side, perhaps dipped in chocolate if it's a special occasion. The final step is to take a quick snap for Instagram so everyone can see what an awesome parent you are! 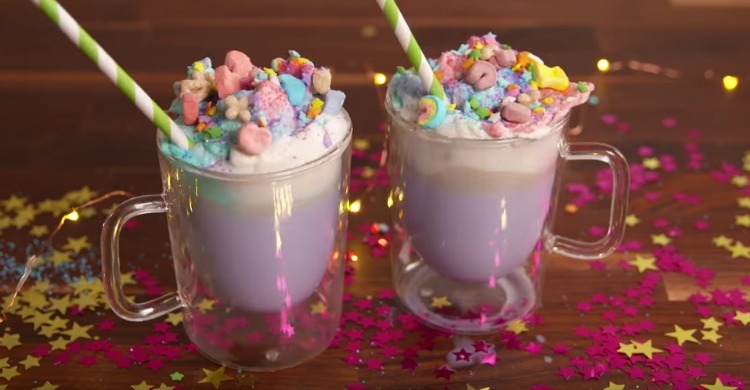 For a drink that’s what dreams are made of, try Delish’s Unicorn Hot Chocolate recipe (pictured above)! Bobbi - "These babycino’s are so good, I wish I was small again!" Chloe - "This gorgeous kids masterpiece is only 50c!" Trish - "The babycinos [here] are definitely Instagram-worthy...with milkshake syrup stripes down the sides and marshmallows and a snake to create a cute face, they are a huge treat in our family." The Avalon has a nice cup of babycino with scrumptious marshmallows to tease the family’s appetite. Is your favourite not on our list? We want to know about it! Let us know or send a picture and we will add it to our list. The babycinnos at The Station Cafe in Wahroonga are definitely Instagram worthy as well. With milkshake syrup stripes down the sides and marshmallows and snake to create a cute face they are definitely a huge treat in our family.